Network issues can sometime cause audio issues in a meeting. 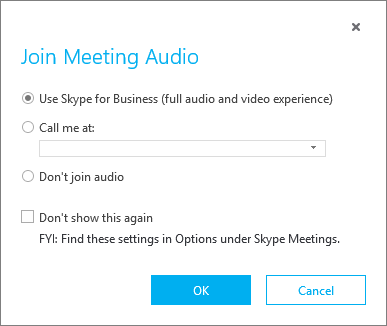 Skype for Business has an option that lets you transfer the meeting's audio to your phone, even while the meeting in progress. You also can choose to use your phone for audio when you join a meeting. Skype for Business will call you at the phone number you choose — and transfer your audio connection to your phone. The meeting will continue for everyone else without interruption, and you can continue to share video, share your screen, or see what’s being presented. When you see the Your network is causing bad audio alert, click Select a Phone. Note: If you haven't yet saved a phone number in Skype for Business, the alert will prompt you to add a phone rather than select a phone. Click Add a Phone, and then enter the phone number you want to use. Select a saved number or add a new phone number. Skype for Business will call you at the number you selected. In the meeting window, click the Call Controls button , and then click Transfer. Choose the phone number you want to use to receive audio for the meeting. 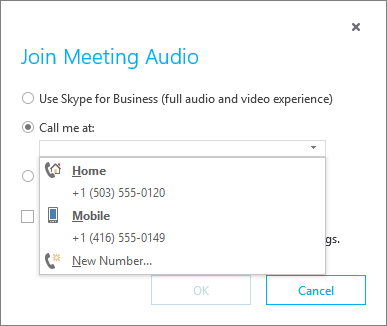 Note: To have Skype for Business prompt you to choose the phone you want to use, go to Tools > Options > Skype Meetings. In the Joining conference calls section, select Before I join meetings, ask me which audio device I want to use. When you click Join Online to join a meeting, you will see this page. How can I choose the number for Skype for Business will call me? 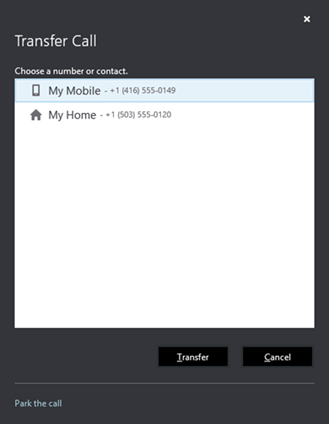 You can either select from your saved phone numbers or enter in a new number and Skype for Business will call you at that number. If you don’t have a number saved, you can also add a phone number, and Skype for Business will save that phone number for convenience. Your phone number will only be visible to you, and will not be visible to your contacts unless you explicitly enable this option. You can also change your number anytime by going to Tools > Options > Phones. Will calling a phone end my meeting? No, calling a phone simply transfers your audio connection to your phone. The meeting will still continue for everyone, and you can continue to share video, share your screen, chat with meeting participants, and see what’s being shared. If you want to end the audio from your phone, you can just end the call on your phone. Will I get charged for calling a phone? When Skype for Business calls your phone, it’s treated like any other incoming call on your phone number. There is no charge for this service. However, any applicable charges from your telephone carrier or cell phone provider for incoming calls might apply.